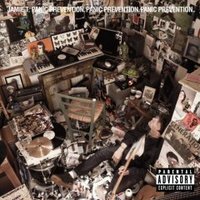 So much great music is coming from the UK these days, but the best new thing out of the UK this year was this record, Panic Prevention, from a young brit who calls himself Jamie T.
Corey, who I know from the UBO days, gave me this record early this year and it’s been a mainstay all year. Josh and I dig this record big time. He likes the opening song, Bass Guitar. We’d get in the car, connect the iPod, and Josh would blast that song all summer long. Like many debut records, there are so many great tracks on this record, including the single Sheila, the thumping bass line of Salvador, the two songs the Gotham Gal can take, Calm Down Dearest and So Lonely The Ballad, and my favorite, If You Got The Money. I also like Ike and Tina and Operation. Hell, all the tracks on this record are great. The comparisons to Mike Skinner/The Streets is obvious, but Jamie T is something a bit different. The live performances I’ve seen on YouTube make him out to be more of a singer than a rapper. If you want a record that will make you laugh, dance, and sing along, get this one. It’s a gem.